Eastern side entrance to the Providence River, on Nayatt Point, off Washington Road. Private residence. When the Nayatt Point Lighthouse was constructed in 1828, the law at the time was to take the lowest bid, which resulted in an unqualified contractor to perform the work, causing the structure to soon fall apart. With so many problems it cost the government much more money than if they had done a little research on the original shady contractor. An 1855 storm damaged the light, and a replacement light was constructed in 1856. In 1866 the Lighthouse Board received a petition from local mariners and ship owners asking them to close Nayatt Point Light and move its light to a stone beacon on the shoal off Conimicut Point. 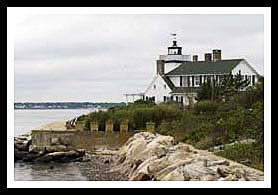 The Board agreed, and closed Nayatt Point, using the Keepers quarters for the Keepers at Conimicut Light, as Conimicut Light didn't have any quarters. Its keepers used the Nayatt Point Keepers dwelling until 1883. Nayatt Point lighthouse is located on the eastern side entrance to the Providence River, on Nayatt Point, off Washington Road. Although still it is best viewed by boat, you can get photos from a nearby tiny fishing beach. Where Route 114 South makes a sharp turn in Barrington just past a shopping center, go right onto Rumstick Road. From there go right on Nayatt Road to Washington Rd where you’ll find a small paved road on the left, which leads to the shoreline where you will find the lighthouse nearby. Again, it is a private residence so stay on the shoreline a distance away. Barrington is a quiet town near the entrance to Providence River. It lies near the East Bay Heritage Trail system which involves a 14-mile East Bay bike path from Bristol to Providence along the shores of Narragansett Bay where you can view Victorian era homes, antique shops, parks, and maritime history museums. Check out Osamequin Nature Trails and Bird Sanctuary, with 38 acres of conservation area, with lots of nature trails and a bird sanctuary. For those who want a little recreation, or have teenagers, visit the Veteran's Memorial Park or Haines Mmemoral Park with softball fields and places for picnicking. Walker Farm has a boat launch onto the Barrington River and 30 acres of open land for boating and fishing. Colt State Park in nearby Bristol also provides an open panorama of Narragansett Bay. Where Route 114 South makes a sharp turn in Barrington just past a shopping center, go right onto Rumstick Road. After a half-mile turn right onto Nayatt Road. Continue to Washington Rd where you’ll find a small paved road on the left which leads to the shoreline where you will see the lighthouse. Be wary as it is a private residence. 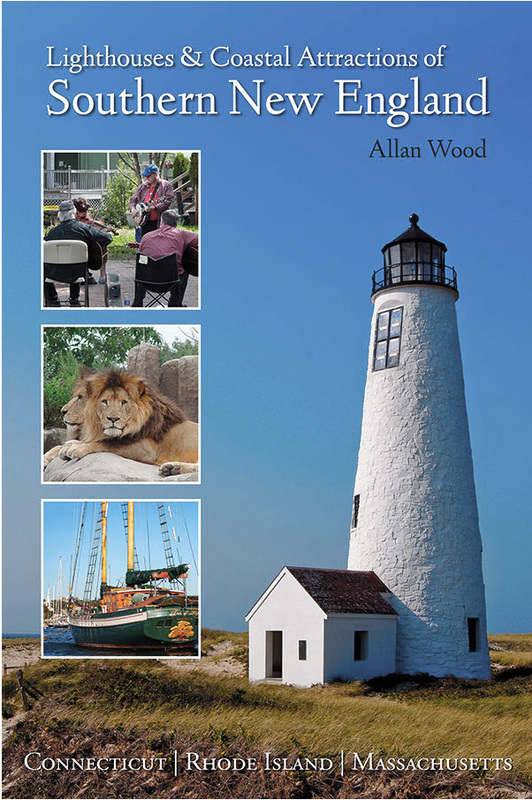 Special organization for lighthouse and coastal preservation provides Ultimate Lighthouse Tour, Northern Bay Lighthouse Tour, and Providence Sunset Lighthouse Cruise on specific days during the summer.